People all around the world know how beneficial spinach can be. However, a handful of people actually know how to make the tasty mouth-watering recipe from this Green Gold. Yes, I call it green gold because of its innumerable benefits. Spinach is a great antioxidant having a number of minerals and vitamins. What makes spinach special is its beta carotene. Spinach has been recommended by health professionals for a number of health conditions. But since we humans love taste before anything spinach has remained underrated. My grandmother used to cook this simple but mouth-watering raita. Try it and send us your feedback. Remove the stems and chop the spinach finely. Heat the ghee in a saucepan over medium-high heat. Add the chopped palak and allow it to cook it for 3-4 minutes on medium heat. Now sprinkle black pepper, fried and grounded cumin powder over it. Keep this raita in the fridge for 20 minutes. 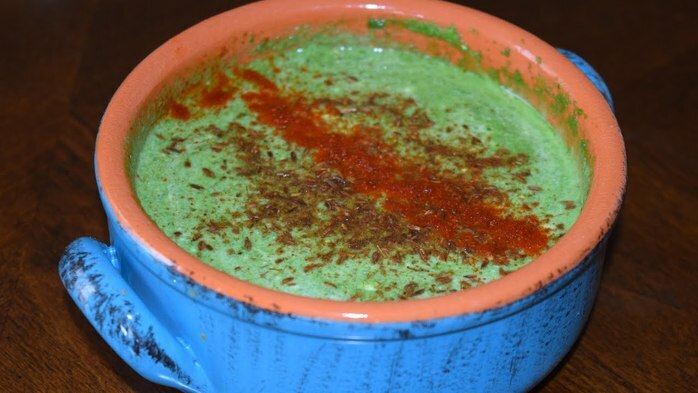 Your yummy spinach raita is ready to serve! Serve it with warm parathas.